For applications that require tight control over device settings and apps, Enterprise Browser 1.6 and higher can integrate with Enterprise Home Screen, Zebra's free Android solution that can lock users out of all but the apps and settings that a company wants them to see. In just a few minutes, EHS can be configured to show a selected set of apps, limit device usage to a single, auto-launched app (via "Kiosk Mode"), prevent changes to device settings, lock out HOME and BACK keys, and much more. For more information, including EHS download, setup and deployment instructions, see the Enterprise Home Screen documentation. Kiosk Mode allows devices to run a single application that cannot be exited. Examples include retail price checkers, auto parts look-ups, patient check-in systems and so on. Kiosk Mode also can be useful when dedicating a device to a single user and/or task, such as a retail clerk's hand-held barcode scanner. Kiosk Mode opens the app in full-screen mode and prevents exit by blocking the BACK and HOME keys. On devices running Android 5.x Lollipop, Kiosk Mode should not be used with Screen Pinning, an Android L feature that works in a similar way. On devices running Android 4.4 KitKat, a "please wait" prompt remains displayed when starting up the device in Kiosk Mode. Press the HOME key to launch the Kiosk-Mode app and resume normal behavior. Before proceeding, be sure that the Kiosk Mode app is installed and working properly. Zebra recommends starting these instructions by editing the default enterprisehomescreen.xml file, which is found in the /enterprise/usr directory on the device with Enterprise Home Screen installed. Specify the Kiosk app label, package and activity (optional) in the <kiosk> section of the config file (shown below), replacing any pre-existing data. Enter a value of "1" in the <kiosk_mode_enabled> tag in the Preferences section of the file. If USB Debugging is desired in Kiosk Mode, enter a value of "0" in the <usb_debugging_disabled> tag (see Disable Kiosk Mode for more info). Remove all apps from the <applications> section. Make any other required changes in the file. Save and push the enterprisehomescreen.xml file to the device; changes take effect immediately. Once the enterprisehomescreen.xml file is pushed to the device, the named app will launch in full-screen mode and BACK and HOME keys will be disabled. For exiting instructions, see Disable Kiosk Mode section, below. Security Note: When using Kiosk Mode, Zebra recommends configuring the EB app to disable "key remapping" and other possible methods of launching applications, which would thereby defeat Kiosk Mode safeguards. 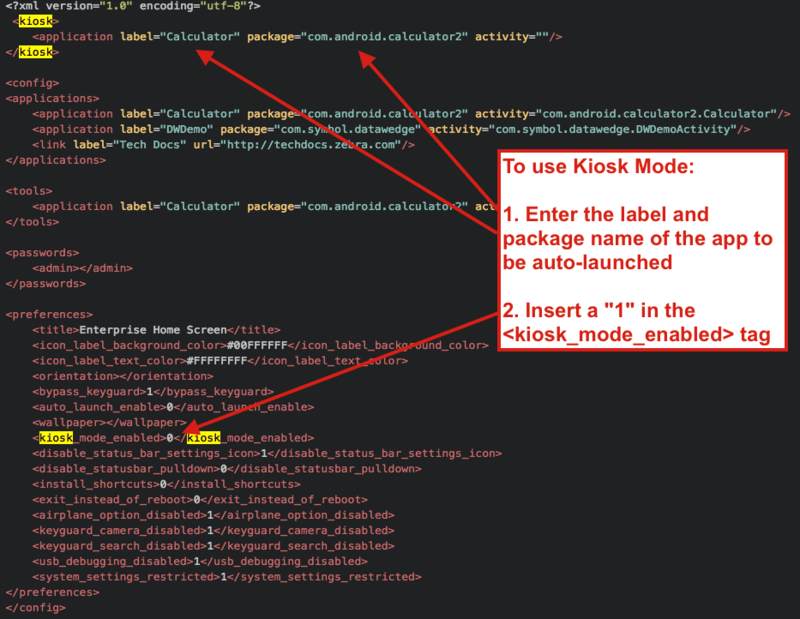 If USB Debugging was not disabled for User Mode, disable Kiosk Mode by pushing to the device a config file with a value of "0" in the <kiosk_mode_enabled> tag. For more information about Kiosk mode, including UI and programmatic access, and working with the enterprisehomescreen.xml file, see the Advanced Settings and Special Features sections of the EHS documentation. User Mode is the default state for EHS. When EHS is running on a device, all apps on the device or installed later are hidden unless they're listed in the <applications> section of the enterprisehomescreen.xml file (shown below). For an application to be shown in User Mode (and available to a user), it must be specified in this list as detailed below. Start with the default enterprisehomescreen.xml file, which is found in the /enterprise/usr directory on the device with Enterprise Home Screen installed. Before proceeding, be sure that any apps desired for User Mode are installed and working properly. 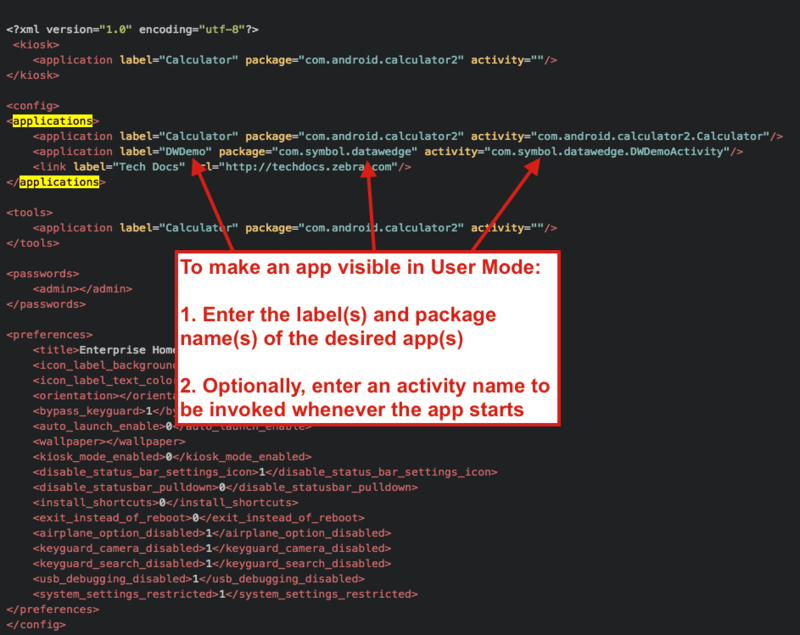 Specify the app label and package (and optional activity) in the <applications> section of the config file (shown above). Enter (or confirm) a value of "0" in the <kiosk_mode_enabled> tag in the Preferences section of the file. Push the enterprisehomescreen.xml file to the device; changes take effect immediately. Once the enterprisehomescreen.xml file is pushed to the device, the specified apps will be visible whenever the device is in User Mode. A solution that uses EHS to lock down an EB app can be mass-deployed using Zebra StageNow or a compatible MDM system, provided the system is capable of setting an Android app as the default Launcher for the device. Zebra recommends testing all apps and configuration files on a working device before general deployment. Create an installation package containing the required files listed above. Deploy enterprisehomescreen.xml to the /enterprise/usr device directory. Check the device for a /<internal_mem_root_dir>/EnterpriseBrowser/ directory. Create if necessary. Deploy config.xml to the /<internal_mem_root_dir>/EnterpriseBrowser/ directory. Set EHS as the default Launcher and set it to launch on device startup. On every subsequent restart, EHS will automatically run, and depending on the enterprisehomescreen.xml file, will launch the Kiosk Mode app or display the apps specified for User Mode.